1 What is Protein Powder? 2 Are There Better Protein Powders? Let’s start with the basics. Protein powder is powdered protein concentrate, which can be mixed with water or milk (for an extra dose of protein). It can also be added into baked goods, such as pancakes, waffles, and cakes, to give your favorite sweet treats a significant boost in pure protein. Protein itself is composed of amino acids, which are essential for building muscle because amino acids are the building blocks of the body’s muscle fibers. When exercising at a high intensity — i.e weight training or strength training — your muscle fibers are physically tearing under the pressure of exercise. The formation of larger muscles, then, comes from the body’s repairing of these muscle fibers. The muscle fibers will interlace over one another to mend the tear, and what are those muscle fibers made out of? Proteins. So without a constant supply of protein shuttled toward the muscles throughout the day, the muscles cannot repair or grow. after training. While it’s not wholly necessary and whole food sources such as lean meats, poultry, white fishes, and egg whites can be a great alternative to protein powders, these other foods also need to be broken down into the three macronutrients by the body. This breakdown slows the delivery of protein to the muscles. Alternative protein sources may also not be complete protein sources, or contain the full amount of amino acids the body needs to repair and grow muscle tissue. So while they will provide some benefit, they may not provide all of it. This can hinder muscle growth, even when you’re technically eating a good amount of protein per day. Are There Better Protein Powders? While there are no inherently bad protein powders, there are some that are better than others. Whey protein powders are milk-based proteins and have the quickest absorption rate of any type of protein, period. (This includes whole food sources and other forms of protein powders, such as pea and soy proteins.) The body absorbs 100% of whey proteins because it is a whole protein source or, again, it contains all the essential amino acids needed to repair and grow muscles. Protein Isolates and Concentrates are specifically isolated whey proteins that are fast digesting and can be quickly broken down by the body. Alternatively, whey protein blends, such as casein, are slow-digesting proteins that can take the body up to eight hours to completely break down. 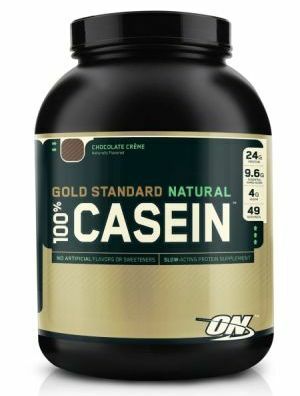 Casein proteins are better for bedtime, so that your body does not go into a catabolic state while you’re resting, but are awful directly after a workout. However, because casein proteins are still whey-based, they have the same high absorption rate by the body but at a much slower rate. So what makes protein powder “healthy”? Simply, it’s a clean protein source. Whey protein powders contain roughly 24g of protein per serving, which is more than a decent piece of chicken. It also has less than four grams of carbs per serving — although the typical serving has about 1-2g — and less than or equal to two grams of fat. This is also why whey proteins have such a great absorption rate: not only is it pure protein, but the body has no other components to break down. Instead, it can quickly be sent to the muscles that are in desperate need of growth and repair. However, you shouldn’t ingest straight protein powder. The consistency ranges from grainy to pillowy soft powder, depending on the variety you purchase. (Imagine trying to swallow a mouthful of cinnamon.) Instead, protein powders can be mixed with water — the healthiest option! — or with milk for a quick, easy, and efficient post-workout shake. It’s claimed that protein should be consumed within thirty minutes to an hour of training, because that’s when the muscles are in highest need of a protein source for tissue repair. Alternatively, protein powders can be baked into goods by mixing into wet batters, such as pancakes, waffles, and cakes. However, this move is a bit riskier. Even though whey protein does have a high absorption rate, mixing the protein powder with other whole food sources, sugars, and liquids can delay when the body breaks the protein down. Remember, the body breaks down foods in the order of: fats, proteins, fiber, and then carbohydrates. If you’re mixing your proteins with your fats, the proteins will have to wait their turn. or Concentrate from your local supplement store or online. Take one to two scoops — the maximum amount of protein the body can absorb at one time is still unknown, but men typically need more per day than women — and mix with water. Consume within an hour after training for maximum efficiency. And for taste? Your safest bet is always chocolate flavored whey.